Why Choose Astral Catering Over Hundreds of Caterers in Houston, TX? Each member of our staff is well trained in the culinary arts and has a deep passion for creative catering where they do not just cook food but create an experience to remember. At Astral Catering we approach each of our catering services with delicacy and precision in order to introduce food that is stimulating, intriguing and exciting. Each event is draped with a touch of class and originality incomparable to other catering companies in Houston Texas. From the consultation to the end result we will engineer a menu, ambiance and staff to fortify the most inspiring event imaginable. Combining the ability to construct client specific events and produce fantastic food allows Astral to provide a menu for any event that denotes a dining experience that equates to any fine dining establishment. Astral Catering understands that our catering menus directly associate with the overall experience of event goers and that is why we work directly with clients to ensure that they are receiving exactly what they want for their event. A local catering company is a great option for gatherings such as weddings, graduations, and birthdays because a customer is able to meet with catering staff and ensure that each aspect of their affair is exactly what they envision. Astral catering understands the extravagance needed to carry forth with wedding catering Houston parties and always approaches an event with a client’s needs in mind. Our professional team is excited to assist in establishing a menu that is privy to a client’s needs and exceed results of most Houston caterers. The top priority for Astral Catering will always be customer satisfaction and that is why we offer a vast selection of menu options as well as the ability to work directly with our team of professionals to build a menu that reflects exact customer specifications. A catering menu is one small part of a successful event and for that reason Astral Catering goes one step further than competitors by supporting client queries with all relevant event planning. Aside from always working directly with clients to hand pick items for a menu we also take time to assist in formulating the perfect theme that associates directly with what a customer envisions for their party. Catering Houston TX takes much responsibility due to the competitive local catering scene and that is why Astral goes beyond just catering and works to provide not only the food their client envisions but the party of their dreams. We can recommend proper thematic elements such as table settings, plating and decorations and will always encourage a client to follow any dreams that they had for their event. Our educated team are available to provide advice in any detailed arenas that directly affect the celebration. From events that are aimed to be intimate to those that should be extravagant we are confident that we can be just the help a client needs in creating the affair of their dreams. We serve all the areas highlighted on the map. If your event is outside of the highlighted area, please feel free to give us a call at (281) 407-5621 or submit a contact form and we’ll make sure we find a solution for you. 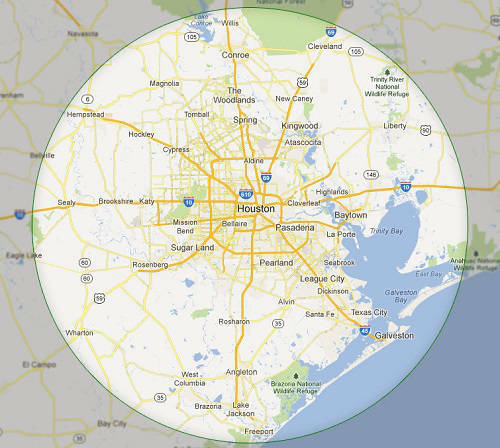 We serve all the Houston’s zip codes as well as all the zip codes of all the areas highlighted on the map.